She will always be your little valentine. 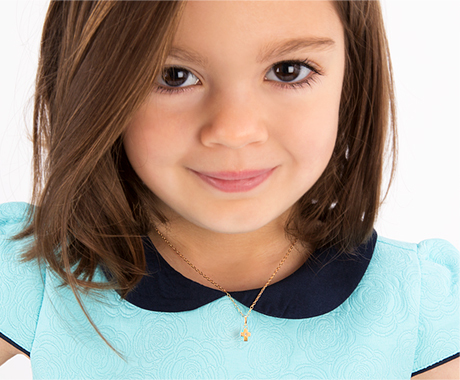 Kids love feeling special and showing off personalized jewelry, featuring their very own birthstone and beautiful initial. These stuning pendants are strung onto an extendable chain, made in Italy, allowing your fast growing girl to keep wearing her favorite pieces comfortably for many years. We have specifically selected designer and customer favorites that will be lasting treasures long after she opens it this Valentine's Day! The necklace has its beautiful classic, charming look. Kids can wear it everyday for its precious decoration. We are very satisfied for its price and nice quality.